When it comes to the development of a global brand in a cut throat market, The Great British Bake Off takes the biscuit. It bakes the biscuit. It goes to the shop and buys the eggs, flour, sugar and margarine. In fact, it appeals to something so innate it makes us dream biscuit before we even know we want one. It is biscuit-snappingly brilliant. Why it's so brilliant has exercised the minds of TV critics and even intellectual property lawyers. What is it about a baking competition in a tent that turns it from part of a village fete into something so compelling? Since its launch on BBC2 in 2010, it introduced three new concepts have to the English speaking world. These are: the signature challenge; the technical challenge; and the show-stopper challenge. Perhaps the only people who understand the appeal of The Great British Bake Off are its producers Love Productions. The show was first produced by its creator Anna Beattie and Richard McKerrow in 2010. At the time critics were slow to warm to the idea. But as is often the case, good producers and savvy audiences are more connected than critics. The audience loved the show, they warmed to the contestants and the presenters. Mary Berry and Paul Hollywood give value for money as well as baking expertise. Mel Giedroyc and Sue Perkins take on the role of light entertainment fire-fighters. They suppress unnecessary seriousness. The genius of the Bake Off is to convert all this fun into a business model that works, not just in the UK, but around the world. Love Productions’ achievement in taking a show from a tent to a worldwide stage in 3 years is particularly remarkable. We must remember what a competitive business they are in. It is also worth considering that ideas for programmes and formats are not directly protected by copyright law. The lead case on this matter takes us back another charismatic name: Hughie Green. He felt his talent show Opportunity Knocks had been copied by a TV broadcaster in New Zealand. His copyright case was rejected by both the Court of Appeal of New Zealand and then the Privy Council in the UK. The courts agreed that the content of Hughie Green’s shows was typical of the general content of talent shows. And so they ruled it was not protected by copyright. This controversial decision, made in 1989, underlined a fundamental point about copyright law. Copyright is a property right that resides in specific artistic works. Copyright law cannot protect ideas for shows. This is because IP law balances the interests of all creative people, not just the ones who arrive first. Ideas are free for all. This freedom allows Love Productions to mix their conceptual ingredients without fear of litigation. Format producers, like Love Productions, must be careful with their intellectual property. Whist their rights might may not be protected directly under copyright law other steps may be taken to protect them. Objectify the format and define its structure and IP. It is possible for graphics, music, scripts and visual images to all be protected as individual IP products. They can receive protection via design and trade mark registrations as well as copyright. This process is perhaps more akin to creating a business plan than an artistic work. If a recording of a new show is made, all the individual IP elements will chime together in a single cohesive experience. Register trade marks. 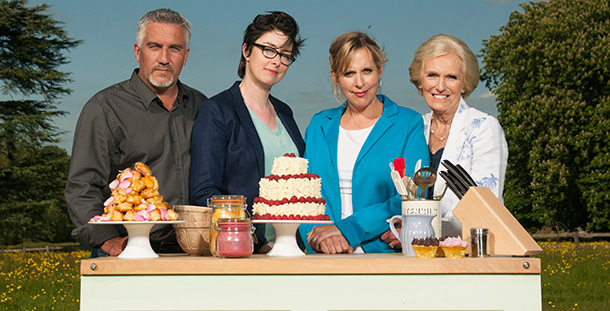 In 2010 Love Productions registered the name 'The Great British Bake Off' (UK trade mark 2557737). In 2011 a second registration (UK trade mark 2603787) was filed extending the scope of protection. Define relationships. Format creation is often a collaborative business. If you are working with a team, draw up contracts so that all rights and roles are understood before the series goes live. Be certain about confidentiality. If you're going to pitch your work, ensure that your audience understands ownership of your product. You can do this by using non-disclosure agreements. What an interesting article. I run a Finnish ex-pat charity here in the UK, called Finn-Guild. To celebrate our 50th Anniversary next year, I am planning to organise a baking competition where our 21 Finnish Saturday schools around the country host cinnamon bun (traditionally Finnish 'korvapuusti') baking heats, with a grand final organised in London. I was planning to call the event 'Finnish Bake-Off', but wonder if I would be in breach of Love Productions trade mark licence?